Use in general cancer patients (i.e., solid tumors and lymphomas). Do not use in patients with brain tumors or myelomas. Patients with a general cancer diagnosis (solid tumors and lymphomas) starting chemotherapy. Do not use in patients with brain tumors or myelomas. Categorizes cancer patients for VTE risk. Higher risk cohorts (e.g. inpatients, lower performance scores) have even higher risks than shown. Most validations were completed in outpatients settings with higher risk cancer patients. Not intended to be used for diagnosis (i.e., clinical suspicion of DVT or PE) but to predict future risk of VTE (see Creator Insights for more). Predicting VTE in cancer patients is complicated and likely improved by a scoring system. The Khorana Risk Score stratifies risk well. In outpatients, VTE risk remains relatively low (~10%) even in the highest score groups. At least one author group has applied a binary version of the Khorana Risk Score in practice, using the result for clinical decision making. The Khorana Risk Score requires multiple laboratory variables, and it may not stratify as consistently or accurately in higher risk patients and those with cancers not indicated in the score. Khorana AA, et al. Development and validation of a predictive model for chemotherapy-associated thrombosis. Blood 2008;111:4902-7. Dutia M, et al. Risk Assessment Models for Cancer-Associated Venous Thromboembolism. Cancer 2012;118:3468-76. Lyman GH, et al. Venous thromboembolism prophylaxis and treatment in patients with cancer: American Society of Clinical Oncology clinical practice guideline update. J Clin Oncol. 2013 Jun 10;31(17):2189-204. doi: 10.1200/JCO.2013.49.1118. Epub 2013 May 13. Why did you develop the Khorana Risk Score for VTE? Was there a particular clinical experience or patient encounter that inspired you to create this tool for clinicians? As a medical oncologist specializing in gastrointestinal malignancies, my patients are often affected by this diagnosis, leading to urgent visits, hospitalizations or prolongation of existing hospitalization and, on rare occasions, death. Hence my motivation to improve our understanding of risk prediction and to focus on at-risk patients with strategies for early detection or prophylaxis. How do you use the Khorana Risk Score for VTE in your own clinical practice? Can you give an example of a scenario in which you use it? We are currently piloting a process for electronic calculation of the risk score in electronic medical records (EMR); if high, the clinician seeing the patient is alerted, and a lower extremity ultrasound for early detection of DVT is suggested. We hope to have additional data regarding this approach soon. What pearls, pitfalls and/or tips do you have for users of the Khorana Risk Score for VTE? Do you know of cases when it has been applied, interpreted, or used inappropriately? The score is for use in a general cancer population (mix of solid tumors and lymphomas). Patients with brain tumors and myeloma were excluded from this. It is not to be used for diagnosis (i.e., clinical suspicion of DVT or PE) but to predict future risk of VTE. What recommendations do you have for doctors once they have applied the Khorana Risk Score for VTE? Are there any adjustments or updates you would make to the score based on new data or practice changes? Currently, the score should be used to educate high-risk patients about the warning signs and symptoms of VTE including DVT and PE. As mentioned, we are piloting a strategy for early detection using screening ultrasound of lower extremities. Finally, we await data regarding thromboprophylaxis in high-risk patients which could be another application of the score. Two large studies utilizing direct oral anticoagulants for high-risk patients as defined by the score are ongoing and results are anticipated for early 2019. We have also been funded to further refine risk stratification in this population by NIH and hope to identify new biomarkers and screening strategies by 2023. Update from MDCalc Editorial Team: both trials have been completed since this interview was published - CASSINI (abstract only) and AVERT. 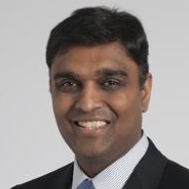 Alok A. Khorana, MD is a professor of medicine at the Cleveland Clinic Lerner College of Medicine, Case Western Reserve University, and the Sondra and Stephen Hardis Chair in Oncology Research. He is currently the vice-chair for clinical services of the Taussig Cancer Institute and director of the Gastrointestinal Malignancies Program at the Cleveland Clinic. His clinical and translational research program focuses on new therapeutics and outcomes prediction in gastrointestinal cancers and cancer-associated thrombosis.